Before you contact us, Please make sure your question is not answered here. You can restore/retrive your account's username simply by contacting us from the registered email address (the email you've used while registering) and we'll be sending you all the associated accounts we have under this email address. You can also retrieve your password easily after knowing the username, Go to https://www.immortals-co.com/index.php?page=restore and complete the form there. Once you submit the valid information, you'll be receving an email in your inbox includes the password. Unfortunately, We do not change the data nor even restoring the security information that way. The only thing you could change is the email address using our website https://www.immortals-co.com/index.php?page=change_email. Unable to download the client? Getting an error while downloading the client? Most likely it's your network being interrupted. However, you can use the Internet Download Manager to be able to resume the download process in case you get it cancelled everytime you try to download it while your network is unstable. Also you can use these alternative download link in-case our CDN provider is having issues with your ISP. We are only able to help you in this case if your account was not a shared account, Otherwise your account will not be supported incase of loss. How to avoid getting hacked? Also playing in a net-cafe could be causing data leak since you might use an infected/malwared computer, and in such a case, We will not be responsible regarding any loss your account might have. Do you have Installation issues/errors? To avoid Initializing application error (0x00007b) Our game installer will be installing the prerequisites packages such as C++ Redistributable packages, and the required version of .NET framework. However if you still getting this error, it might be your DirectX is broken or entirely missing. If you are receiving a "repair required" message from the Launcher right after you installed it, That would be either your antivirus has marked some files as virus and deleted them or even your installation was not completely done. However, We highly recommend you to uninstall the game through Control Panel > Programs and Features. Then re-installing it using our Installer again. 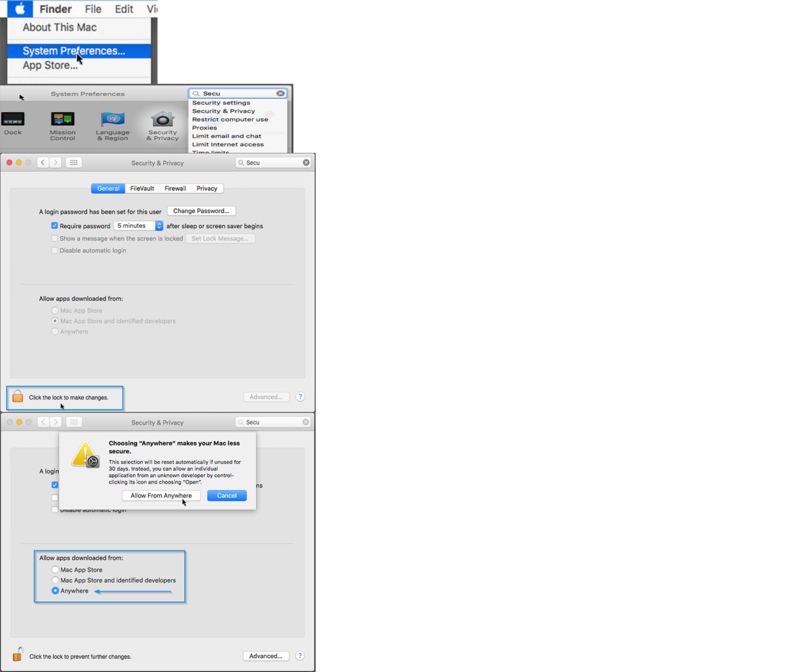 Most of Mac OS users may experience the same error the image shows in below. In such a case, Please consider applying the following steps or click here for a picture guide. From Terminal, use the following command. After providing your password, Go to System Preferences > Security Tab and Set the "Allow apps downloaded from:" to "Anywhere". If you are looking forward to restore a deleted character, You will have to send us (by an email) the following information, in order to proceed with the restoration process. Once you provide us with these information at staff@immortals-co.net, We will be able to proceed with the restoration process. Please note that it may take a few days to get this process completed. Please try to log in and it will be stating why you are banned. Whatever it says there, is not up to discussion because it was decided upon evidences and not upon others words. Hopefully you understand that. Please note that we do not unban players, Especially if your account has been banned for longer than a year which is considered as permanent ban. Even though, Your account might have been deleted within the deletion cycle we do every while. Basically We do not support scam cases so you gotta be careful while trading/selling/buying from strangers or people you do not trust, We are doing our best to warn you from the not-recommended players in-game so please pay attention to the warning messages you get while trading with players. Also When it comes to funds transfers. We highly recommend you to get the funds first before paying a dime. Since we do protect the funds owner not the buyer. You don't need to contact us in such a case, Because the only way to reset it is using the Setting(in-game) > Secondary > Forgot option and wait for 7 days until it gets reset itself. When is the next sale/event? So once we decide any, We will be notifying everyone there or via Facebook. You can load funds onto your account using our Purchase page, and you can further use them to buy any from our available offers here Store. Please note that we do not do any deals regarding purchases, You do get VIP according to your balance. Reporting a glitch or an exploit? The only and the most recommended way to report glitches or exploits would be through the email address "staff@immortals-co.net" explaining how to repeat the bug/glitch/exploit include a video if possible uploaded on youtube, or you can attach it via an email. Looking forward to know more about some in-game features?